On the shores of the Baltic Sea in 1995. In May 1995 my partner and I set off for a two and a half week safari around the (relatively) newly independent Baltic States - Estonia, Latvia and Lithuania, with stopovers in Sweden and Finland thrown in. We went in my Ford Mondeo, sailing from Harwich to Gothenburg and Stockholm to Tallinn, returning via Helsinki. Whilst western cars weren't entirely unknown, right hand drive cars most definitely were. We were frequently stopped by traffic police who seemed totally confused to find the driver on the 'wrong' side of the car. This gallery features the train and tram pictures I took on what was a fascinating and unpredictable holiday. EVR - Eesti Raudtee - Estonian Railways. 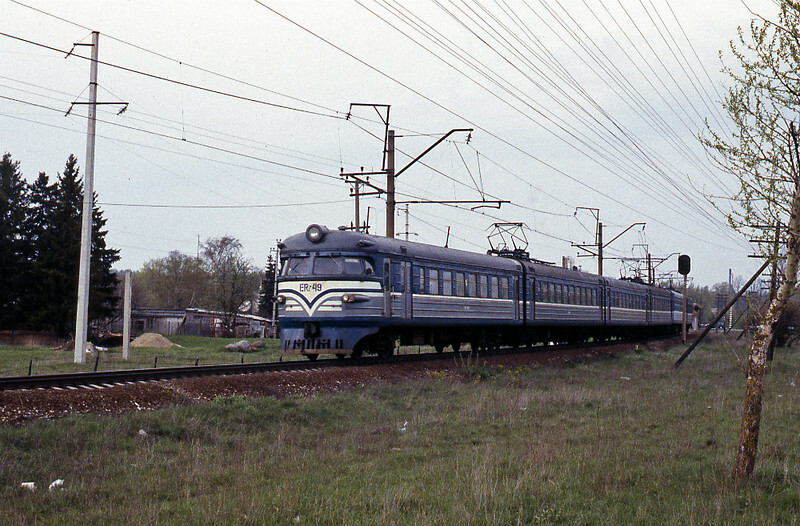 A 3kV DC ER1 EMU (built in Riga between 1957 and 1962) on a local train from Tallinn to Paldiski at Nomme.